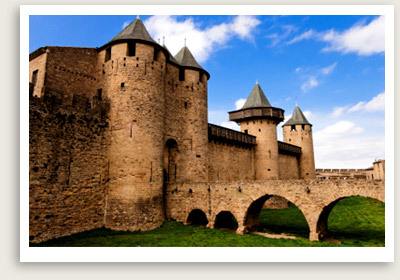 Carcassonne Tours Include: Private transportation, English speaking tour guides, taxes, tolls and parking. Enjoy a privately guided tour to the medieval walled town of Carcassonne, a UNESCO World Heritage site. Carcassonne now claims to be the most-visited such site in France, surpassing even Mont Saint-Michel. Your private tour guide will take you on a guided walking tour of Carcassonne along the city’s narrow cobblestone streets, admiring Carcassonne’s Gothic architectural treasures such as its cathedral. You will also enjoy a walk along the fortified walls, enjoying a beautiful view of the surrounding countryside and town spread below your feet. Time permitting, the new city center of Carcassonne is a very short distance away; you will have some free time to explore on your own before retuning to Toulouse.